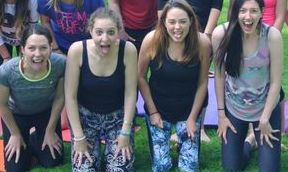 Laughter Yoga is a unique concept that allows people to laugh without the use of comedy or jokes. It is called Laughter Yoga as it combines Yogic breathing with laughter exercises. We use laughter exercises, eye contact and if people are willing it creates the potential to change fake laughter into authentic laughter. There is scientific evidence to prove that the brain cannot tell the difference between real and fake laughter anyway so we get the same benefits. It was created in 1995 by a Medical Doctor called Dr Madan Kataria. Please bring water and wear comfortable clothing. Avoid eating a couple of hours before the class or eat lightly if you need to. We start with some gentle warm ups and use the exercises below in the class. Laughing for a sustained period of time (10-15 minutes) is key to reaping the health benefits of laughter yoga. Classes help students laugh steadily. Contact Sandhya for more details. or Subscribe to the mailing list to be informed of other yoga, pilates and laughter events in the area.